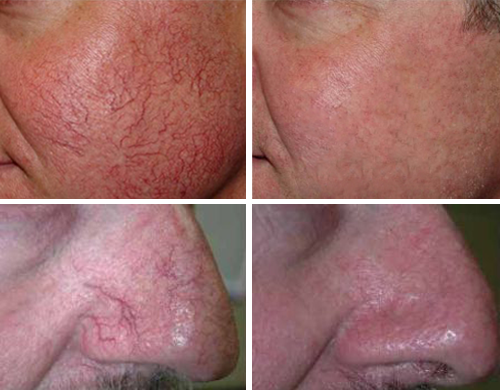 Lasers allow for quick treatment of vascular lesions without damaging the surrounding skin. Light is absorbed by the blood, destroying the vessel. Over time, the vessel disappears, restoring the skin’s natural appearance. We can effectively treat many types of vascular lesions, including facial and leg telangiectasias, spider veins and unwanted sun spots and moles. A complimentary consultation will be required for treatment of such skin disorders. There is no downtime with the laser treatment of veins or spots. Usually 2 – 4 treatments are required. Topical anesthetic may be applied prior to treatment at the practitioner’s discretion. #207, 1324 11th Ave S.W. With the purchase of a MANZILIAN LASER treatment package (4 treatments at regular price $1600) you will receive an additional 4 treatments absolutely free! With the purchase of a BACK laser treatment package (6 treatments $2600) you will receive an additional 6 treatments for your chest and stomach absolutely free! EVEN BETTER … with the purchase of both of the above packages we will add your ears and brows for free with every laser treatment visit WOW!! !